The Fethiye flotilla is an ideal one week cruise with daily distances slightly shorter than those our other flotillas. 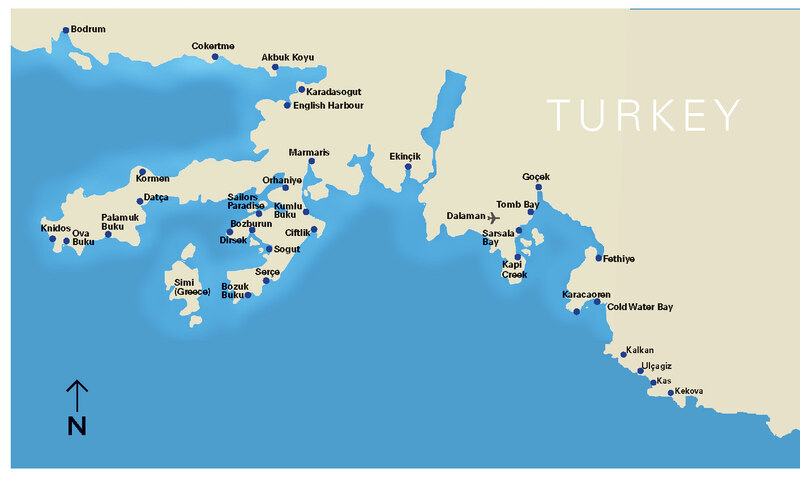 Each evenings anchorage sees the flotilla moored in a delightful bay or charming small village where you can soak up the Turkish culture and enjoy mouth-watering local cuisine served up by welcoming family run restaurants. Sunday: Tresane Island (12nm) where numerous ruins dating from Lycian Byzantine times. Monday: Sarsala (5nm) This is one of our favourite bays in the Fethiye Gulf, The restaurant is newly renovated and offers stylish al fresco dining with winderful views across the bay. Tuesday: Karacaoren (15nm) Protected by cliffs, small islands and numerous reefs. This bohemium styled restaurant is full of rustic charm iand offers a bit of vintage Turkey serving traditional Turkish cuisine cooked in wood burning ovens. Wednesday: Boynuz Buku (20nm) A large well protected bay with pine and olive tree cladded hills. Dine ashore under the stars in a sea lapped garden setting. A walk over the hill can be rewarded by a splash in the waterfall. Thursday: Tomb Bay, (5nm) This is one of many wonderful bays and coves in the gulf of Fethiye that can only be reached by boat. The stylish restaurant is run by a local family who pride themselves with their offerings of great mezes and spit roasted food. Friday: Fethiye (15nm) enjoy a great beam reach right across the Bay of Fethiye returning to the home port where we dine ashore in a great restaurant located in the colourful Market Bazaar. Note: Turkey sailing holidays: Routes may vary during the season according to weather and operating conditions. The flotilla crew will keep you fully briefed each day. Also see Itineraries under Info & Booking Conditions. Sunday: Kapi Creek (15nm) An almost land locked cove with great walks over the hills (Take your swimmers!) Fabulous food served by the family run restaurant. Monday: 22 Fathom Cove. (2nm) Meet Racep, one of lifes real characters. Sit with his family for afternoon 'tea and cakes', but save some appetite for the wild boar casserole or freshly caught fish this evening all prepared from Racep's own floating kitchen! Tuesday: Cold Water Bay (17nm) This is an absolutely stunning location with a friendly, family run restaurant serving great local Turkish cuisine. Wednesday: Tomb Bay (20nm) Time to sample the wonderful cuisine at the 'Olive Restaurant', dine ashore with views across the bay to the ancient Lycian rock tombs. Whilst on holiday a Turkish shave is a real must 'for the men!' so why nor try the local barbar - all part of the restaurant service. Thursday: Wall Bay (2nm) This smart restaurant, seems at first a little out of place, but rest assured the food is delicious. The new showers and facilities are excellent. Try experiencing a Turkish Haman (Turkish Bath), or take a long walk over the hill to an ancient windmill or just cool off with some snorkelling whilst gazing at the rock tombs. Extras: £55pp Transit Log & £85 Security Insurance. Based on 2 person Sharing 2 cabin yacht. Flight inclusive packages are available through Sunscape with departures on Saturdays throughout the day with a choice of flights available from Gatwick, Manchester, Bristol, Stansted, Glasgow and Edinburgh, Birmingham, to Dalaman Airport with afternoon and evening return flights. Flight Time 3 hrs 40 mins. Direct road transfers from Dalaman Airport to Fethiye Yacht Base take approximately 45 minutes.